As I write this, it's been five years exactly since I became a mom. I always take special interest in those "first days with a new baby" pictures on Facebook or Instagram. The moms always look so happy. Tired, but just glowing, you know? Gushing, snuggling, soaking in the wonder. That's what moms do, I guess. My first day of motherhood? I ended up in the hospital bathroom, crouched on the floor, worried about everything, crying over nothing. From the very beginning, motherhood smacked me in the face. Call me naive. (I probably was.) But from the first contraction, everything was shockingly harder than I ever expected. Why didn’t you tell me? I asked my mom and sister after labor. The whole thing was nothing like I’d hoped, or expected. It had been painful, and scary, and unnatural-feeling. Then we took Sam home, and things just got harder. No time to sleep (and too many worries even if I’d had the time). I was shocked how physically hard motherhood was. My legs hurt, my back hurt, my feet ached... I didn't know how to do anything. I couldn't "shush" my baby. I was bad at nursing. At times, I even got angry...at a newborn. I'd obviously reached an all-time low. For the first time in my life, I was failing - completely and utterly failing - at something. And not just something, but what I thought had been my life's calling. So I began to doubt myself. All my life I had longed to be a mom. Had I been wrong? Everyone told me, “You’ll love being a mom. You’ll be such a great mom.” Then why wasn’t I? I began to shrivel under the cloud of shame and loneliness. And somehow, despite all the raging hormones and sleep-deprived thinking, I made one fierce, determined decision. This was hard.And no woman I knew would ever feel this shame and loneliness I was feeling. 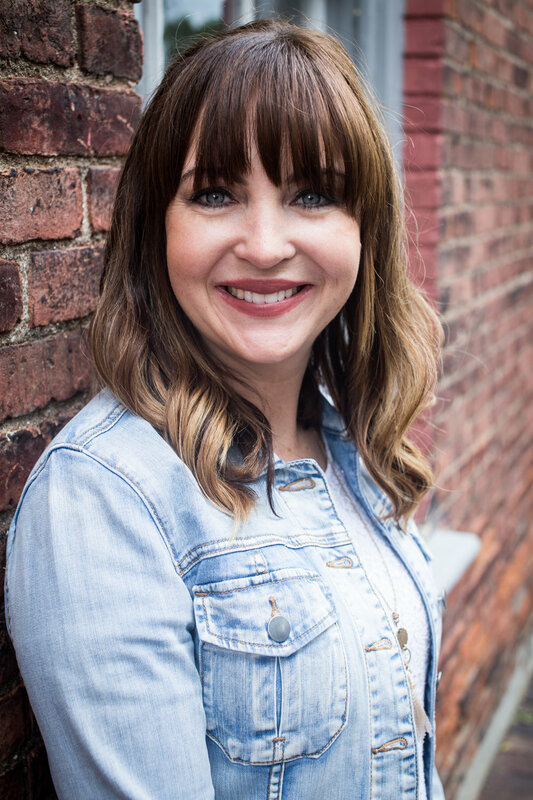 If I ever, ever knew anyone who was struggling with motherhood, who wondered why in the world she couldn't "get it together," who felt like "the only mom in the world" who didn't love motherhood, or didn't seem to be good at it...this poor friend would not feel alone. She might feel desperate, bitter, or ready to snap...but she wouldn't feel alone. And so I did two things. One, I started a blog. And two, I gathered up as many women as I could, same bone-tired, new-mom stage as I was, and brought them together for prayer and community. See, I knew in my core that we needed each other, needed to know we weren't alone. 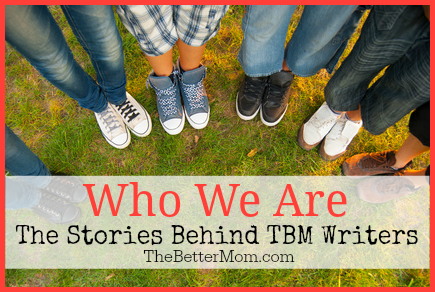 This month Ruth asked the writers at TBM to share a little about our story, and why we write. I write to tell you you’re not alone. You’re not alone when you realize motherhood is the single hardest thing you’ve ever done (Been there.). You’re not alone when you can’t do it all. (I am there.) You’re not alone when you struggle with anxiety, or depression, or keeping your temper with your children (Been there, too.). It may feel like you are the only mom who struggles with this or that, but trust me, you are not alone. But we moms need to - on those hard days when you feel like a failure - to know that we all struggle with something. And we need to remember those hard days, and share them with our friends when they struggle. To let our darkness be light for someone else. I had one kind soul (one) during my post-partum depression say to me, "Oh, I felt that way. It's okay, sweetheart, you will be okay." And I nearly wept a sigh of relief. So, yes, your struggles - they can help someone. How has motherhood surprised you? Do you feel like you have a good support system for those difficult seasons of motherhood?